Deb Sitron stopped to say thank you. Chicago beaches made national headlines when they were completely covered with garbage after the sunny Memorial Day weekend. Teamsters Local 700 members Jim Gillespie and Theodas Griffin started work at 4 a.m. on Tuesday, May 31 and had the entire lakefront pristine and back to its original condition by noon the same day. 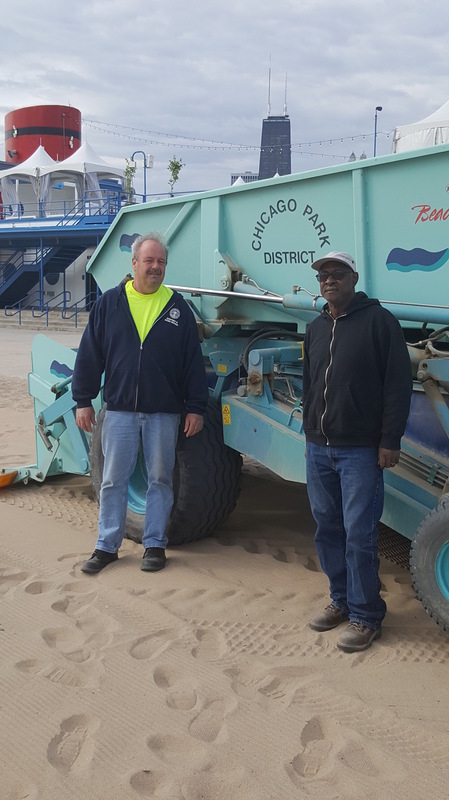 The Chicago Park District beach workers used machines called a beach groomer and beach sanitizer to pick up all of the trash left behind on the holiday. The machines dig seven inches into the ground and pull up litter that’s been buried under other garbage and sand. The sanitizer is so precise it can pull up small stones and rocks. 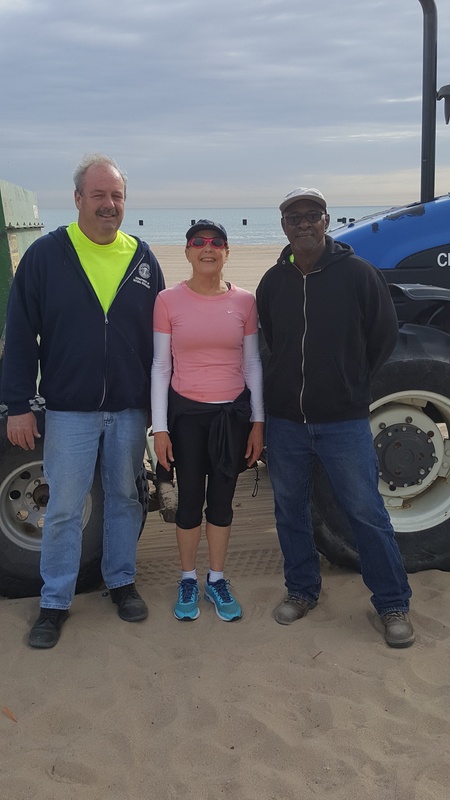 Local Chicagoan Deb Sitron was jogging along the lakefront near Oak Street Beach on May 31 and stopped to thank both men for their hard work in making the beaches beautiful again. Teamsters Local 700 represents approximately 50 Chicago Park District workers. Visiting a Chicago beach this summer? Place all garbage and recycling in their appropriate containers. Garbage — especially leftover food — attracts birds and other wildlife to the beaches, resulting in water contamination. Keep dogs in designated areas. Pick up after your pets and place pet waste in trashcans.